We humans are all amateur psychologist and skilled mind readers because we are obsessed about strategic information. The most strategic information is “what do others think about me”. You can surely remember many critical situations in your own life in which you desperately wanted to know what certain people think about you. In partner selection, in job selection, in many negotiation situations… Maybe you dreamed about being a mind reader in the literal sense. Note that mind guessing becomes most critical in cases where you want to make someone an offer, or you need to take a critical decision among several offers made by others to you. Some biologists say that the obsession for mind reading was one of the primary forces in evolution for the unusual development of human brain in a relatively short time in geological terms. All this is not different in business life, especially in marketing and sales. Marketing people are obsessed about guessing the reactions of potential customers for future offers, because this is one of the key success factors for every company. Luckily, historical data about the behavior of potential customers give important clues about their preferences, so the marketing people can make use of the historical information to make informed guesses about the future. We all know that historical data can be very valuable, but can we measure and quantify this value? In most cases yes, we can, if we understand measurement as reducing the uncertainty; not as producing an artificially exact number (see How to Measure Anything: Finding the Value of Intangibles in Business from Douglas Hubbard). I will try to illustrate this with a refreshingly simple model example. To feel myself more familiar with the topic I chose the example of a mail-order company that sells aquarium fish food. I had once founded a similar company selling all kinds of aquarium articles excluding live fish over internet. Angelic Fish Foods is a mail-order company that sells fish foods to aquarium keepers. Its business model is quite simple: It sends copies of colorful mail-order catalogs to potential customers by ordinary post, and receives orders by telephone, mail or fax. We assume that we are in the good old times before the internet era to keep everything simple; internet has so many different marketing channels that complicate the matter. Angelic Fish Foods plans to launch a new product Angel food for angelfish with a direct marketing campaign (angelfish is a very beautiful and popular aquarium fish. 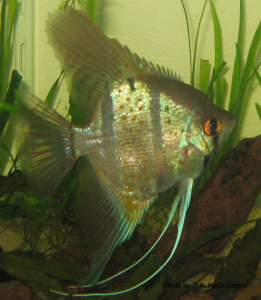 It is cichlid species with the scientific name Pterophyllum scalare). Each promotional snail mail to a household with some promotional material introducing the new product costs $5 to Angelic Fish Foods. We assume that only aquarium keeping households are prospective customers. A household without an aquarium never orders fish food. That is, sending a promotional mail to an aquarium-less household is a total loss for Angelic Fish Foods. Gondwanaland, a city with hundred thousand households, is one of the areas where Angelic Fish Foods wants to launch its marketing campaign (Gondwanaland: inspired by prehistorical continent Gondwana in paleontology). Gondwanaland has 100’000 households. Some of these households keep aquariums. Gondwanaland is a totally new market area for Angelic Fish Foods; it doesn’t have any information or idea whatsoever about the aquarium-keepers in Gondwanaland. Each promotional snail mail for the new fish food “Angelfood” to a household costs $5. Only aquarium-keeping households are potential customers for Angelic Fish Foods; the probability of response from an aquarium-less household is zero. Goal of the direct marketing campaign: Reach all aquarium keeping households in Gondwanaland with promotional mails whatever it may cost. In this first model case, Angelic Fish Foods’ goal is reaching every aquarium-keeping household, that is every potential customer, with its promotion mails whatever it may costs. This ambition would cost half a million (100’000 x $5) to Angelic Fish Foods if the company has absolutely no information at all about the aquarium keepers in Gondwanaland. The only choice would be then sending a promotion mail to every ten thousand household in Gondwanaland to fulfill the goal, and reach every aquarium-keeper household. 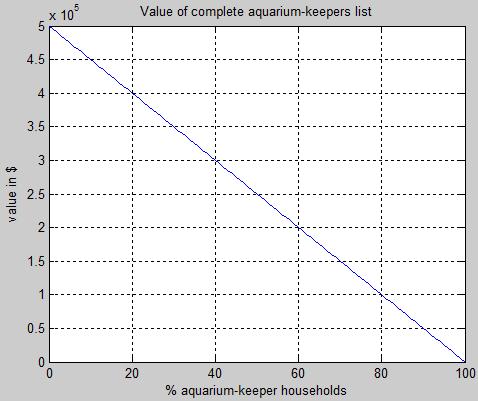 What if someone had a complete list of all aquarium-keeper households in Gondwanaland? What would be the value of this list for Angelic Fish Foods? What if for example someone offers the list for $400’000? How can Angelic Fish Foods evaluate the price? The value of the list depends on the percentage of aquarium keepers in Gondwanaland. For example, assuming that 10% of households have aquariums, the value of the list will be 90% x 100’000 x $5 = $450’000, because it will save Angelic Fish Foods from wasting $450’000 by sending 90’000 unnecessary promotion mails to aquarium-less households. With a list of aquarium owners (assuming that it is complete) Angelic Fish Foods can target prospective customers with 100% hit rate. 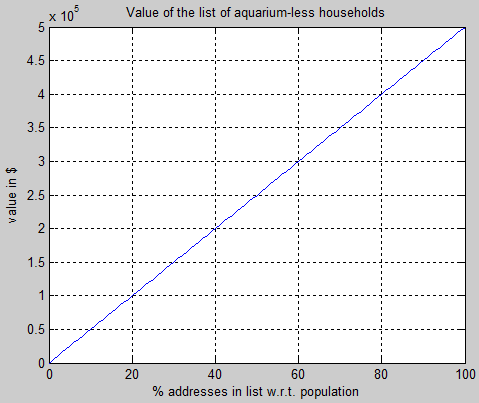 .. where P is the percentage of aquarium-keeper households in Gondwanaland. 1) What if the percentage of aquarium owners is not known in advance? 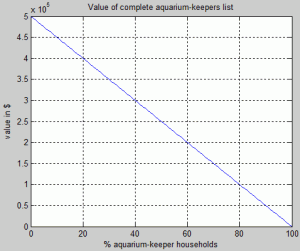 How can we then evaluate the value of the list of aquarium keepers? Assuming that the list is trustable for its correctness and completeness, Angelic Fish Foods should ask the number of households in the list. With the number of households the exact value of the list can be evaluated. What if the seller of the list doesn’t give the number for free? Here comes the experience and gut feeling of marketing managers into play. According to the formula above, the value of the list will be $400’000 or more, if the percentage of aquarium keepers is 20% or less. Any experienced marketing manager should know that the ratio of aquarium owners is always much less than 10%. That is, gut feeling (if there is any) will tell that Angelic Fish Foods should buy the list, of course, not without negotiations to reduce the price. Even gut feeling is valuable information, because it is often based on experience and it helps you much to reduce the degree of uncertainty. What if Angelic Fish Foods has absolutely no idea and no gut feeling at all about the percentage of aquarium keepers? 2) What if the list of aquarium owners is not absolutely complete? The list of aquarium owners would be absolutely worthless even if a single household is missing, because Angelic Fish Foods will then need to send mails to every household anyway to reach all potential customers. The goal is strictly defined as reaching every aquarium-keeping household in this model case; even a single aquarium keeper can’t be left out. Actually, a list of aquarium-less households would be much more useful and straightforward for Angelic Fish Foods. The information value of such a negative list would be simply equal to the number households in the list times $5, and it doesn’t need to be complete to have a value. For example, a small list of 100 aquarium-less households saves 100 x 5 = $500 because it tells the company that no promotional mails should be wasted on these addresses. The value of a complete list of aquarium owners comes in fact from the implicit information about aquarium-less households in this model case. In this case, the goal is not reaching every aquarium-keeper with promotion mails in Gondwanaland. The goal is this time maximizing the profit of the direct marketing campaign applied only on existing customers. Furthermore, Angelic Fish Foods uses historical sales data of existing customers to increase the performance and profit of the campaign. Angelfish is after all a cichlid species; it can also eat cichlid food even if its taste is inferior to the new angelfish food. That is, the customers might have been buying cichlid foods for their angelfish at home. Angelfish is a relatively large cichlid species which eats lots of food. Higher sales numbers for cichlid foods could imply among other things that the customer is keeping angelfish. Angelic Fish Foods has 11’000 existing customers in Gondwanaland. Promotional mails are sent only to these existing customers. Angelic Fish Foods earns $50 from a package of “Angelfish food” if a customer responses to promotion mail. Each household (i.e. customer) can order only one food package. A promotional sail mail costs $5 to Angelic Fish Foods. Response (to promotion mail) means $45 net earnings ($50 – $5), no response means $5 net loss. Historical sales data are used for estimating the response probability of each customer. 1) Evaluation campaign: Angelic Fish Foods sends first promotion mails to randomly selected 1’000 customers among the total 11’000 in order to evaluate the correlation between the historical sales data and response behavior of customers to the campaign. Through this evaluation campaign Angelic Fish Foods plans to obtain the estimated response probability of each customer as a function of his historical sales data. 2) Main campaign: Angelic Fish Foods sends promotional mails only to the selected customers with positive estimated (or expected) net earnings among the remaining 10’000 in order to maximize the earnings. The evaluation campaign is used to estimate (or approximate) the conditional probability of a customer’s response to a promotion mail as a function of his historical sales amount (i.e. cichlid foods purchased in last 12 months). This conditional probability is an estimation like: The probability of customer’s responding to the promotion mail, that is ordering a food pack, is 30% if his historical sales amount was $50. In the main campaign, Angelic Fish Foods sends a promotional mail to a customer (which costs $5) only if his conditional probability of responding is higher than the break-even rate of 10% ($5/$50). 10% is the break-even probability, because only above this rate the expected net earnings from a promotion mail will be positive. You can see conditional probabilities in the graph at the left hand side. 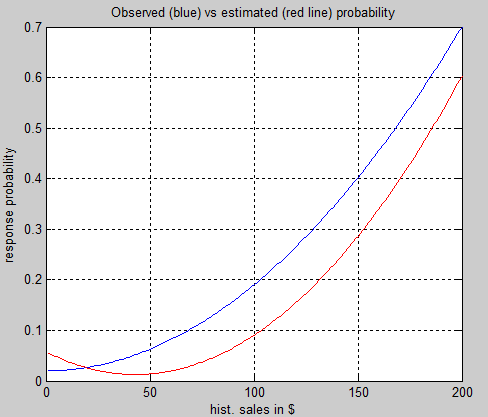 The blue curve shows the real (assumed) conditional probability as a function of historical sales, which is used to generate historical and observed response data of the customers. The red curve is the estimated conditional probability curve which is constructed according to the response data obtained in the evaluation campaign with the single input (sales amount) polynomial linear regression method. 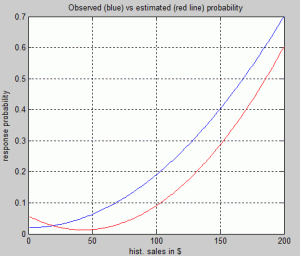 Note that the break-even probability of 10% is reached for sales amounts above $100 in the estimation curve. This means, Angelic Fish Foods will send promotion mails only to those customers with sales amounts above $100 in the main campaign. The lift curves at the left depicts the cumulated responses (number of food pack orders) of customers during the main campaign. The blue curve shows the responses of selected customers with positive expected net earnings (i.e. 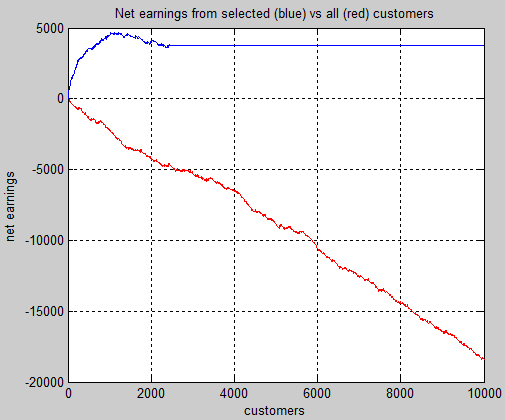 historical sales amounts larger than $100) with estimated customer scores (estimated probability of response) sorted in descending order from left to right. That is, 1 on the x-axis is the customer with the highest estimated response probability, 10’000 is the customer with the lowest response probability w.r.t. blue curve. Note that after the first 2453 customers the lift curve remains constant, because promotional mails are sent only to these 2453 customers with the highest estimated scores. 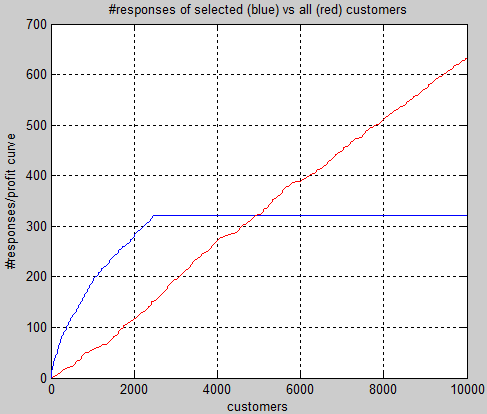 Red curve shows the cumulated responses of all customers without any selection or ordering. It is the reference case that shows what would happen without using the estimated probabilities obtained from the evaluation campaign. Promotional mails are simply sent to all customers without any selection and ordering. Coming back to our primary topic “value of information”, what is the value of customer information gained by the evaluation campaign? Was its information value higher than its costs? Angelic Fish Foods invested $2’000 in the evaluation campaign and earned $3’785 in the main campaign, with $1’785 net profit as a result. That is, $2’000 was the cost of information, and at least $3’785 was the value of customer information. I say “at least” because linear regression, the probability estimation method, was probably not the best method for making most of the statistical customer information obtained in the evaluation campaign. Supplementary PowerPoint slides and matlab files used to simulate the example cases explained here can be downloaded from the download page. This entry was posted in Uncategorized and tagged direct marketing, information value. Bookmark the permalink.